All is right with the world now the Utes have beat BYU. After several Facebook friends pointed me in the right direction, I was finally able to fully enjoy the Nov. 27 Utah/BYU football game. The computer screen obviously doesn’t offer the same view as live TV, but after my experience in the antiseptic University of Utah skybox section at Rice-Eccles Stadium a couple of weeks ago (when TCU played and Utah didn’t), I’d have to say catching up after the fact on YouTube and sports websites is superior to watching the same game from a skybox. For example, I’ve probably seen Brandon Burton’s blocked field goal that sealed the win for Utah at least 50 times now from 50 angles, and each time it gets better and better. Contrary to what some BYU fans have come to believe, Burton actually did block the game-ending field goal attempt of his own ability—the referee didn’t interfere, nor did Kyle Whittingham slip a banana peel under the feet of BYU kicker Mitch Payne. Neither did I see the long arm of the Lord swing a timepiece before the hypnotized and befuddled BYU blocker who allowed Burton to do the do-si-do around him faster than a high-stepping square-dancer in the cast of Oklahoma. I don’t know that blocker’s name. Thanks to him, I’ll remember Burton’s name. Also thanks to him, Mitch Payne was denied his own legacy moment. 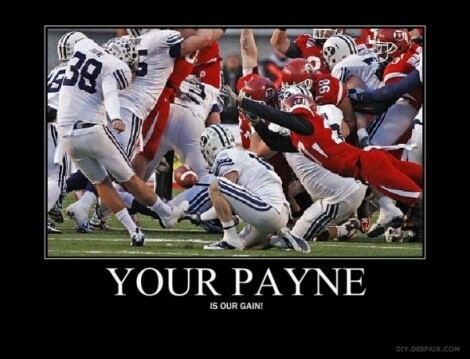 No offense to Mr. Payne, who is a fine kicker, but … good. That blocked kick assured, as all Ute wins over BYU do, that our fragile world is back in balance. For the 364 days after BYU won the 2009 matchup with a game-ending overtime touchdown pass, there was no sun. Nothing but nothing is right in our universe when BYU beats Utah at football. Nothing. I’m sure a BYU fan feels otherwise, but that just proves that a BYU fan will believe anything. They probably even believe that Max Hall is a good guy. It looks to me, however, that the current BYU quarterback, Jake Heaps, is indeed a good guy. Well, as nice as one can be and still go to BYU, that is. He held his own against Utah, was crippled in the end by his own coaches (who decided to run the ball in the waning seconds of the game, not pass), he had a lot to learn and overcome this year as just a freshman, and in defeat, he was as gracious as could be. Contrast the post-game Heaps after losing to 2009’s victorious post-game Max “I Hate Everything About Utah” Hall. At just 19, Heaps looks to me to be everything Hall wanted to be but without the god-awful arrogance. There’s no way I could have held my act together as Heaps did all season long, especially after this particular game. I was a muttonhead at 19. I spent my time playing pinball, hearts and snooker in the University of Utah Union Building, not getting crunched by both defensive linemen and sports reporters. And when I wasn’t doing that, I was busy scheming to spill beer on anyone named Hall. I taught other meatheads like me how to do it (which really requires not spilling any beer at all, just allowing oneself to be accused of it). They passed it on to future knuckleheads. Little did I know that my actions would result in an honorable tradition spanning two states and would become front-page news: “Hi, is your last name Hall? Great. Then this beer’s on me … I mean, you.” Ha ha. That’s how it started one night after sneaking into the old Crows Nest on State Street. Naturally, like all good things, it grew into a really good thing: “Your son is Max? The BYU quarterback? Let’s make it a pitcher. No, wait. A keg. Scratch that. Just stand there while we get the friggin’ Budweiser truck over here to douse you guys.” The next thing you know, the inglorious Max Hall is whining about beer spillage on his family (uh, did he mention his team or coach after last year’s BYU win?) and is soon out the door on his way to an NFL contract. That’s not right. That’s what I mean about the world being out of balance when BYU beats Utah.